Find community and commiseration at prenatal yoga! 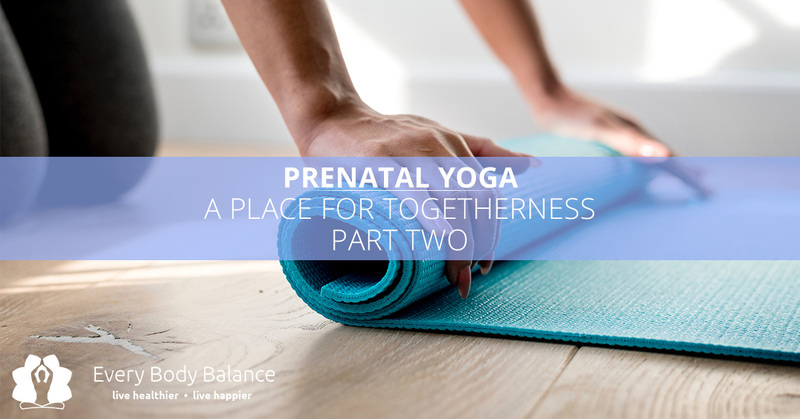 In part one (check it out here), we began to navigate the truths and experiences you’ll only find at prenatal yoga — the inclusivity and the encouragement from expecting mothers. At Every Body Balance, we offer yoga tailored to pregnant women and a myriad of other classes all in one convenient membership. Join us in part two, as we learn more about what you’ll come to find in a prenatal yoga class. Prenatal yoga offers a space for you to not only relax but to enjoy a space where you can just be you! There is no judgment in prenatal yoga. Prenatal yoga is a space created for those to just be and move at their own pace — no one judges you if you don’t feel like holding downward dog for a second more or if you lie in corpse pose the entire class. There may have been a time when yoga was a time to test yourself and grind through a dripping wet mat to hold poses longer, but prenatal yoga is about being in tune with your body and nourishing it. Even if it’s a place where you can relax and take a little nap, the women in this space all understand and honor your decisions. On the other hand, if you are riding a surge of pregnancy hormones that are making you feel unstoppable, go on with your badass yogi self! Hold the poses longer and do the more challenging version — all while opening your hips and strengthening your pelvic floor for childbirth! There will be big emotions. Pregnancy is an emotional time — the ebb and flow of it all can become tiring and when the hormones that are throwing a nine-month house party in your uterus decide to change, tears can flow. Maybe these tears are from stress and disturbed sleep or perhaps they are happy tears because you had a sip of wine last night and almost a full cup of caffeinated coffee this morning and it was heaven — whichever scenario you feel, the big emotions are always welcomed and shared by the women around you. Yoga props will get you through the class. As your body begins to undergo changes as your belly gets bigger and bigger, you will greatly benefit from yoga props. There will soon be a time when you have a fortress of props around your space — a block to rest on here and a bolster to support your back there. You’ll soon realize that you don’t care if you look like a prenatal yoga prop hoarder because you’ll be so comfortable in every pose as you are lulled into a prenatal bliss. Your maternity wear is prenatal yoga-ready. Let’s be honest — you are probably already wearing prenatal yoga pants every day anyway, so you don’t have to invest in a whole new workout wardrobe for the classes! You can easily go about your day — from yoga to running errands without having to change your clothes — it’s athleisurewear at its finest. Prenatal yoga is the perfect space to find a community of women you can be yourself around without judgment while participating in a physical activity that is beneficial to your pregnancy. 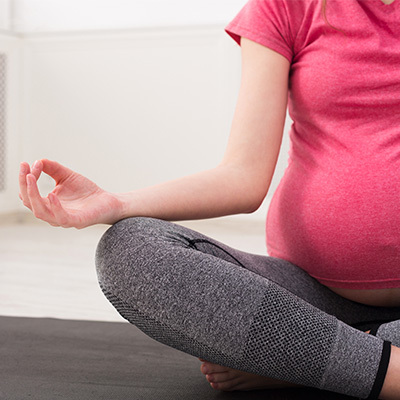 To sign up for prenatal yoga, connect with us today!